Pipe is stepping down as mayor of Hackney after being named London’s new deputy mayor for planning by mayor Sadiq Khan. Pipe has been a persistent critic of the scheme. The two councils on whose land the development is supposed to be built – Tower Hamlets and Hackney – said last year they would have refused it planning were the decision still theirs to make. Tower Hamlets’ mayor John Biggs has been a lower-profile critic of the development which is being planned by joint venture developers Hammerson and Ballymore. But this week he broke cover to express the hope that Pipe’s new role will kick the current plans into touch once and for all. He said Pipe’s appointment was “excellent news, not least because I’m sure that one of his first acts will be to kill off the oversized and unwanted Bishopsgate development which is currently awaiting a decision. Boris Johnson's planners at the Greater London Authority (GLA) have scrutinised the Goodsyard plans since September and on Friday 9 April published their report, which recommends that the Mayor refuses the planning application on the grounds of 1) impact on sunlight and daylight 2) harmful impacts to listed buildings and conservation areas. “The More Light More Power campaign for a better Goodsyard welcomes news that GLA officers recommend refusal of this brutal and damaging scheme. We are, however, alarmed to read in their report how the standards required of this development continue to be negotiated down, particularly in respect of affordable housing, heritage issues and the unacceptable impacts on the loss of daylight and sunlight to hundreds of surrounding properties. Developments of this scale that have such a significant impact on their surrounding environment should be designed to the highest standards, not the lowest, so while we welcome the officers' recommendation we are aware that such negotiations continue and remain wary of the final outcome. Two borough councils, two local Mayors, councillors from all parties, over 11,000 petitioners, over 500 letter-writers, over 150 businesses, all local MPs and now the GLA’s own planning officers object to this application. We look to our Mayor in his final 22 days in office to support the overwhelming planning-led objections to this monstrous scheme, and to join all of us on the road to a development that makes the Goodsyard great." Come to the re-launch of Development Hell at St Leonard's, Shoreditch on Thursday 14 April at 6.30 - 9.30 pm. Development Hell is an exhibition of documentation and art that sheds light on the murky planning of Shoreditch and wonders how it came to this. With wine, music and outdoor films. Cumulative effect of Shoreditch towers seen from St Leonard's Churchyard. Norton Folgate and the Goodsyard are connected by the City of London's expansion plans but they are two different sites. The More Light More Power campaign is about the GOODSYARD. See more below. Norton Folgate is a 2 acre in Spitalfields, currently leased by British Land from the Corporation of London. The collection of warehouse buildings and houses was assembled by the Corporation as part of a code-named Operation Glasgow where they acquired properties in order to build a large site for offices, which could join with the Goodsyard. The aim was the compete with Canary Wharf and attract major business occupiers. The Norton Folgate site with the proposed 11 acre Bishopsgate Goodsyard site to the north. 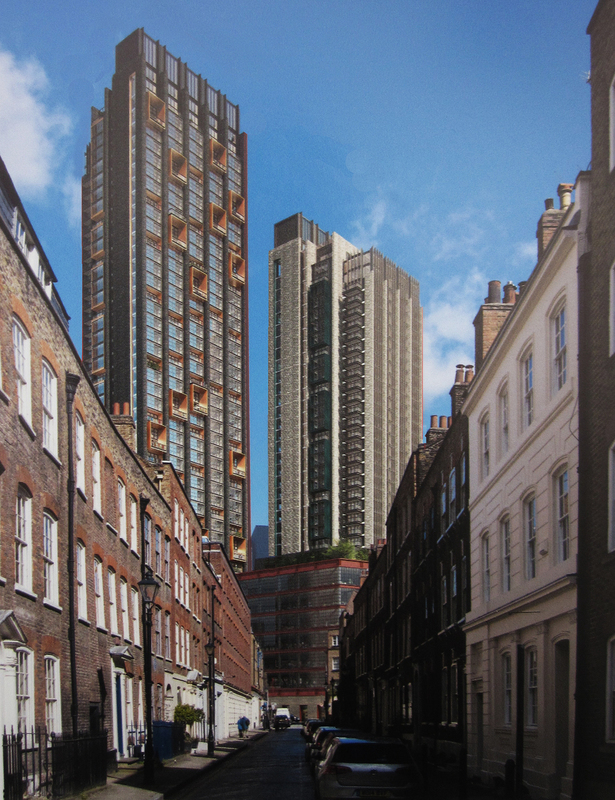 The view of the proposed Goodsyard towers from Norton Folgate site in Elder Street. Chris Blackhurst in The Standard reports that the market is cooling for luxury property that's bought off-plan by overseas investors. If these investors pull out after putting down their deposits the development project is in trouble. The Goodsyard plans will rely on forward selling of their luxury housing, although scrutiny of the plans reveals that the two main towers would not commence until 2021 with the whole development not completed until 2032! Hammerson have already kept the site empty since 2002 while they waited for the right market conditions and this uncertainty is set to continue, with nothing being built on the site. The MP for Bethnal Green and Bow Rushanara Ali said on the Sunday Politics: "What you've got at the moment is the London Mayor overriding planning decisions, for instance at the Bishopsgate Goodsyard, which is thousands of properties, towers going up and most Londoners won't be able to afford to buy them. Boris Johnson has decided to recall planning decisions by Hackney and Tower Hamlets where only 10% of properties would be affordable. That kind of contradictory behaviour is completely at odds with trying to deal with London's housing crisis. What I want to see is a Mayor working in partnership with local authorities, not just Labour local authorities, all local authorities, to make sure that we apply the right kind of pressure on developers because they are getting away scot-free and making a profit but doing very little for Londoners." For years the developers Hammerson and Ballymore have carried out consultations with the local community about the Goodsyard, yet their proposals have ignored all the feedback. We are now holding our own consultation and exhibition next Sunday 17th January for two days. See what the property developers want to do to our area and the profits they will be making from it, hear about the alternatives and have your say at our Public Meeting all at ST HILDA'S EAST COMMUNITY CENTRE, 18 CLUB ROW, E2 7EY near Arnold Circus. Though Boris Johnson will ultimately decide, on 10 December both local planning committees voted to reject the plans on the recommendation of their officers, Tower Hamlets voted unanimously and Hackney by 6 votes to 1. None of the developers turned up to defend their scheme, which was seen as showing contempt for local people and for the process. Both authorities are now urging the Mayor of London not to ignore public opinion—while both local mayors have hinted there could be action in the courts if he ignores the impact on the environment and the lack of affordable homes contravening London’s legal planning guidelines. Meanwhile Hackney Council has launched a poster campaign urging people to tell Boris Johnson to reject the plans. They have also made a short film telling people to write to Boris Johnson. Show public support for Hackney and Tower Hamlets' refusal of the plans. Local resident, David Donoghue explains the issues with the updated Bishopsgate Goodsyard proposals and urges residents and businesses of the Shoreditch, Spitalfields and Brick Lane areas to sign the petition against the existing plans. The Spitalfields Society has responded to the Tower Hamlets council final consultation on the revised planning application for the Bishopsgate Goodsyard with a series of devastating criticisms. The Society’s latest objections cover the excessive height of the buildings, overshadowing and loss of light, the poor quality of accommodation, lack of affordable housing, poor connectivity, addition of even more offices creating gross over-development and lack of public access to a site owned by the public. “If it were to be approved in its current form I believe our councils - officers, members and Mayors - would become a national laughing stock," says Rupert Wheeler, a leading member of the Society’s Executive Committee and himself an architect. The latest amendments, says Wheeler, have not addressed any of those objections and as a consequence “We therefore repeat our request to the Council that this application be refused outright. We also repeat our request that this highly significant site be the subject of a properly consulted masterplan by the two authorities working in partnership that might guide a far more sensitive, detailed and sustainable form of development of which all of London can be proud. The Spitalfields Society have urged all Londoners to sign the More Light More Power petition calling for the plans to be rejected. You can also read the original objection letter by the Spitalfields Society here. HEIGHT AND MASSING: At 46 and 38 storeys for the two main towers and 30, 26, 24 and 17 storeys for others, the height of the development is dramatically out of scale with the surrounding area. It will harm the setting of the surrounding five conservation areas and their many listed buildings. The massing is overwhelming and has no relationship to the adjacent, mainly small, plot sizes and low buildings. DESIGN: The generic tower blocks will appear out of place and do not respond at all to the local character of the surrounding areas. The developers say it will be “a new place with its own distinct scale, identity and character” which is contrary to the planning guidance for the site issued by Hackney and Tower Hamlets. DEMOLITION: A large amount of 19th-century historic fabric that survives on the site will be demolished, including many of the brick arches and the notable Victorian wall that runs along Commercial Street. IMPACT ON LIGHT: 43% of the existing surrounding buildings surveyed by the developer’s consultants will suffer major loss of sunlight. Most of the residential area to the north, including the Boundary Estate, will be cast into shadow by the towers for many months. Obviously, this is completely unacceptable. The proposed green space will be in shadow during the afternoon and evening throughout the summer, making it much less attractive than promised. AFFORDABLE HOUSING: The small amount of affordable housing - 10% suggested - is unacceptable and nowhere near the Council’s requirements. EMPLOYMENT SPACE: The development will not meet the need for affordable workspace and threatens to push out the small-scale independent businesses. Mayor of Hackney: "Sign Petition to Save Shoreditch!" Mayor Jules Pipe believes the high-rise development ‘will cast a shadow over the whole of Tech City’. Pipe is also concerned the City-fringe scheme could threaten the unique character of Shoreditch. The petition is on change.org HERE and we urge everyone to sign it as soon as possible. According to Mayor Pipe: ‘These towers would stand almost as tall as One Canada Place at Canary Wharf; that might be OK for the City, but it is completely out of scale for Shoreditch. These luxury flats, which are well beyond the reach of ordinary Londoners, will cast a shadow over the whole of Tech City, and threaten to damage the local, creative economy. And if you want to take action against the towers, begin by clicking here. Read all about Mayor Pipe's position HERE. Hackney Citizen: "Mayor of Hackney slams 'out-of-scale' plans for Bishopsgate Goodsyard"
Hackney Gazette: "Mayor of Hackney launches 'Save Shoreditch' campaign"
The campaign to stop the monstrous Goodsyard proposals has seen significant press in recent days, particularly following the launch of Hackney Mayor Jules Pipe’s “Save Shoreditch” campaign. If you want to take action against the towers, begin by clicking here.